Playnet Review 2019: Is Playnet a Good Hosting? Founded in 1998 as a division of Brain technology SPA, Playnet provides WordPress hosting, VPS, and dedicated hosting from servers located in Florence, Italy. Their services revolve around performance, reliability, and scalability. 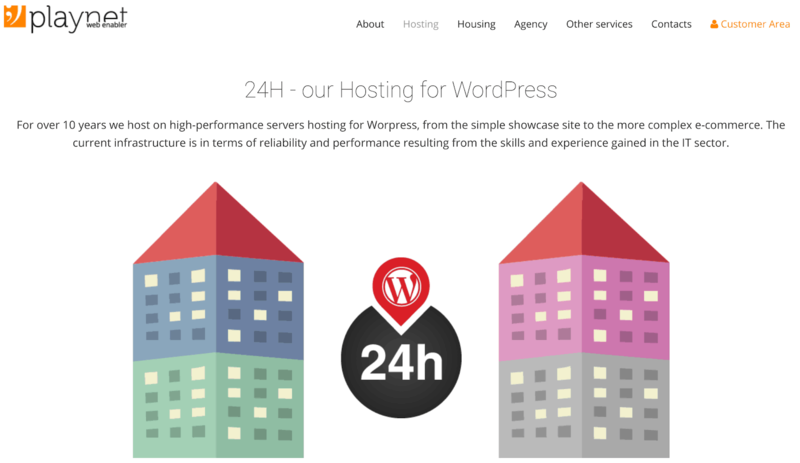 In operation for more than 20 years, Italian company Playnet provides WordPress hosting that caters to the needs of personal websites and small businesses with low traffic requirements. They also offer Virtual Private Server (VPS), Virtual Data Center (VDC), and dedicated server plans to larger businesses with higher traffic needs. They offer two WordPress hosting plans: Top Silver and Top Gold. The Top Silver plan can be used to host basic websites with manual backups. Although both Perl and PHP are supported, you can’t get into the phpMyAdmin section or MySQL databases. The Top Gold plan additionally allows you to access phpMyAdmin, turn on PHP safe mode, monitor your resources, and automatically back up your files (with a fee to restore them). Although these hosting packages are for WordPress, the top plan is flexible enough to allow the Joomla CMS. All shared hosting packages are managed using the Plesk control panel. The downside to these plans is that they cannot host more complex websites with large traffic. Data transfer is limited to 20 MB monthly, even on the top plan, which is very little even for personal websites. And you can only have one FTP user. If your needs exceed what is offered by the WordPress plans, you can opt for the VPS plans that give up to 100 GB HDD, unmetered bandwidth, and up to four CPU cores. If you’re not too bothered about limited data transfer or FTP access then you’ll find that Playnet’s WordPress plans give you many value-added benefits at a low price. Their relatively cheap VPS plans allow you to scale up by choosing the features that meet your budget. Customer support is not 24/7 but they respond fast when they are online, and their SLA obliges them to resolve any faults within four hours of you submitting a ticket (else you get a month’s free hosting). You can also access support via telephone, email and live chat. Playnet offers WordPress hosting, VPS, Virtual Data Center (VDC), and dedicated server plans. The virtual server-based WordPress packages provide a good number of unlimited value-added features but at the expense of limited data transfer allowances and a limit of one MySQL database. Wondering how Playnet stacks up against other Web Hosting companies? Enter any other Web Hosting company and we will give you a side-by-side comparison.